Rebuilding trust in the banking system and between regulators and the organisations they regulate is an essential part of a sustainable recovery in the European banking sector. While progress has been made, there is still work to be done in repairing trust in the banks’ numbers, their future conduct, and their approach to pay and bonuses. More than seven years on from the financial crisis, the recent volatility in the bonds and share prices of European banks suggest a fragile level of trust in the banks’ numbers and prospects. This private dinner with Andrea Enria will focus on the recalibration of the relationship between banks and those that regulate them, and on how both sides can work to rebuild trust. 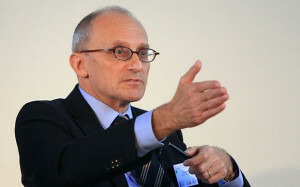 Andrea Enria has been chairman of the European Banking Authority since it was launched in 2011. He was recently elected to serve a second five year term. He was previously the secretary general of CEBS (the EBA’s predecessor) and head of regulatory and supervisory policy at the Bank of Italy.